Let me start out by saying I have never tried or cooked Spaghetti Squash before. I kept seeing different recipes on Pinterest and the cheesy ones looked great. I decided to try cooking one. I was a bit surprised when my squash rang up at $5, so I was hoping I would like it and not waste the money on my attempt at a new side dish. I took my new vegetable home looked up the recipe and noticed I didn’t have any of the correct ingredients. So I looked up a few different recipes and decided to use what I had and hope for the best. It was a success in my eyes. I found it easy and delicious. I hope you will find this recipe to be a successful one for you too. Enjoy!! Using a sharp knife, VERY CAREFULLY, cut the squash in half, see picture below to see which way to cut it, this is hard to do, but go slow and careful. Scoop the seeds out with a spoon, give the cut sides a really good salting, I have read from other posts that this cuts down the moisture. 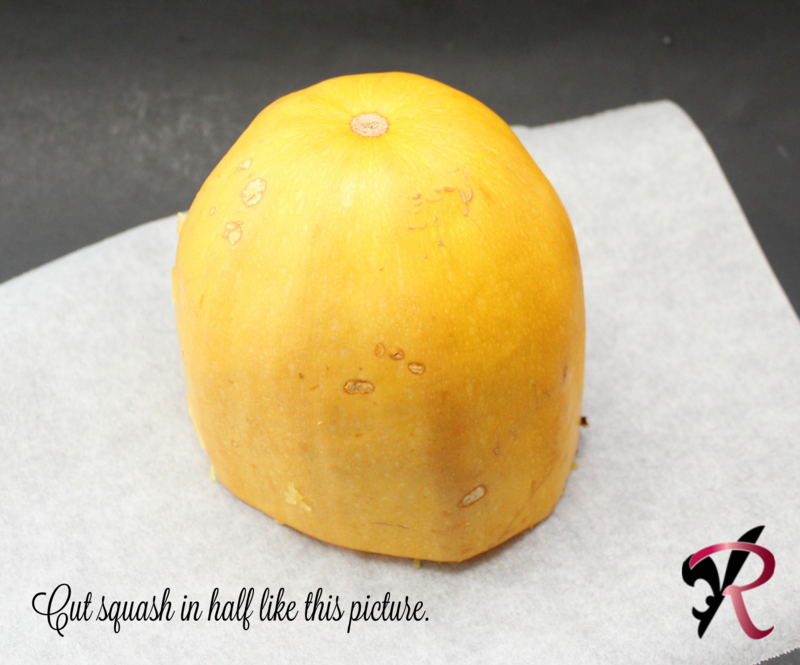 Place the squash cut side down on a parchment lined cookie sheet. Bake 35 minutes. While that is cooking, cut the green onions and garlic cloves, cook them in 1 tablespoon oil until they start to brown. Remove fry pan from heat and add dash of salt & pepper, sour cream and parmesan cheese, mix to combine set aside. shred the 4 oz., of cheese now if you need to. After the squash is cooked, remove from oven after 35 minutes mine still had some bite to it, but I enjoyed it that way. Turn the squash over carefully to release any steam, let sit for about 10 minutes to cool. with a large spoon start removing the squash the skin. When you have it all out, place it in the fry pan, mix to combine, then add into a 8×8 broiler safe pan. Add cheese to the top. Broil on high about 4 minutes or until cheese is brown and bubbly on top. See photo above. Visit thecountrycook.net to see where I add my recipes weekly, also visit my recipe links page for more link up parties. 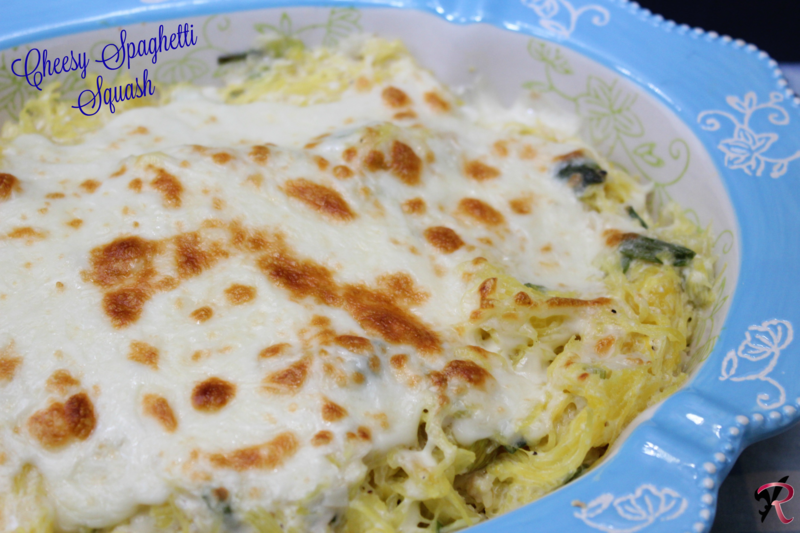 Your Cheesy Spaghetti Squash looks amazing! Hope you are having a great week and thanks so much for sharing with Full Plate Thursday! I love the yummy ingredients, especially those cheeses! They all sound so great together! Thank you for sharing at Celebrate It!